When they're not making wine, Napa greats Carl Doumani, Bill Harlan, Francis Ford Coppola and Pat Kuleto get together to compete in fierce games of five card draw. Doumani raises the stakes by inviting his pastry-chef daughter, Lissa Doumani, and her husband, chef Hiro Sone, to cook. It's been said that you need two things to succeed in poker: steady nerves and a sober constitution. That's certainly a glorious notion, but what happens when the poker game is held on the grounds of a winery? Or even worse, what if the players are vineyard owners who each shows up with a bottle of his very own wine under his arm? Well, the short answer is that the card game moves very slowly. The wine, however, disappears before the chips even hit the table. The setting for this, the most unsober of card games, was the Quixote Winery in Napa Valley. It took almost three months for host and proprietor Carl Doumani to organize the event. "With schedules like the regulars have, you start making the calls around October, and you're lucky to have a game set by January. Once a year is really all we can hope for these days." The "regulars" Doumani was referring to include a veritable who's who of California wine: Francis Ford Coppola, Bill Harlan and Pat Kuleto. The tradition is that every year each regular can invite a new player. This time they were joined by Ron Santella, who runs a hedge fund, and a local tomato farmer, Dean "Dino" Cortopassi. No one knows for sure, but the players speculated that this was the 10th such gathering. The stakes, $5 ante, were low considering the group's communal net worth, but like most poker games played outside Las Vegas, the true purpose wasn't winning money but enjoying the company. Doumani's daughter Lissa and her husband, Hiro Sone, the owners of the highly regarded Napa restaurant Terra, were in charge of the meal. Sone was on hand to greet the players as they arrived, bearing plates of his own version of Terra Chips made from beets, parsnips and potatoes, as well as Japanese potato croquettes and tekka-maki, sushi rolls of seaweed-wrapped rice and raw tuna. While most of the dishes were presented simply for their inherent deliciousness, the tekka-maki belong to a real gambling tradition. The culinary arts and gambling have a long history of intersection. The concept of putting meat and vegetables between two slices of bread, for example, was famously the work of the Earl of Sandwich, who came up with the idea at a gaming tableone night in 1762. The Earl wanted to eat and gamble at the same time. "Sushi rolls have a similar origin. In Japanese, tekka means 'place of gambling,'" said Sone. "The seaweed wrap was introduced so gamblers could eat without getting rice on their cards, or tiles"not to keep things tidy, but to prevent their cheating by marking the cards. The Napa dinner began with stir-fried green beans wrapped in tortillas, another kind of finger food. The main course was succulent slices of rib-eye steak topped with a tart watercress salad and accompanied by roast fingerling potatoes, a refined take on the classic meat-and-potatoes combo. The wines included Harlan's coveted 2000 Harlan Estate, a Cabernet blend with a huge cult following. Kuleto brought his 2001 Kuleto Estate Cabernet, while Coppola contributed his 1999 Niebaum-Coppola Cask Cabernet and Doumani opened his 2001 Panza Petite Syrah. After the ice cream sundaes with homemade fudge and caramel sauces had been demolished, the men moved the 500-pound dining table and replaced it with an early-1900s poker table set with chips and cards instead of plates and silverware. Every card game has its own personality. Depending on the stakes and the seriousness of the players, a tempo is established. In the most intense settings, 20 hands can be dealt in an hour. In Napa, however, it takes that much time just to get the game going. The initial idea was that the players would each buy in for $200. But after counting their chips, they discovered that every gambler had between $300 and $500. Doumani, a glass of Encantado mezcal in one hand, couldn't imagine how things got so confused. After a long discussion, the group decided to play for $300. Fo rthe first hand of the night, Coppola dealt a game of Five Card Draw. Once the final card had been dealt, Kuleto showed a pair of jacks. He bet an amount equal to the pot, roughly $50. Harlan, the only other player left in the hand, thought long and hard about calling the wager. For the first time, the room was silent. After Harlan finally folded, the group reminisced about their last gathering, when one friend who'd just closed a multibillion-dollar business deal had nearly had a nervous breakdown over whether to call a $100 bet. In one of the last hands of the night, Kuleto called another game of Five Card Draw: jacks or better to open, trips (three of a kind) to win. If nobody has a good enough handwhich was the case this timethe game is redealt. 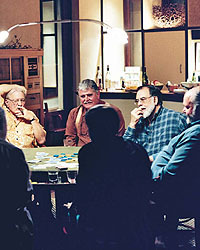 After all the players tossed in their cards, Coppola noticed that the chips were missing from the middle of the table. Kuleto was stacking the chips he hadn't won. "Umm...Pat, the game's not over," Doumani pointed out. "Nobody had trips." Kuleto broke into a huge, sheepish smile as he realized his mistake. "Oops. My fault. Somebody pass me a fresh bottleuh, deck." Andy Bellin is a Los Angelesbased screenwriter and author of the bestselling Poker Nation.